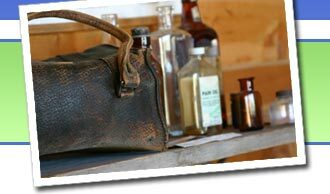 Vintage and antique Civil War medical instruments and equipment, including scalpels, bone saws and other surgical equipment, diagnostic instruments, pessaries, speculums, apothecary items, and other medical equipment used by doctors and dentists during the Civil War era. Antique Childs Eyeglasses Spectacles, Extendable Ear Pieces, Civil War Era. Carte De Visite Civil War General Hermann Haupt and Invented Drill Brochure.